I had a long overdue mooch around Majestic recently. To be perfectly honest, a large proportion of the wines were predictable old fellas. But search hard enough and there are some real gems. I managed to walk out with 15 bottles having lightened my wallet to the tune of £222 (a double Nelson, for the cricketers out there). 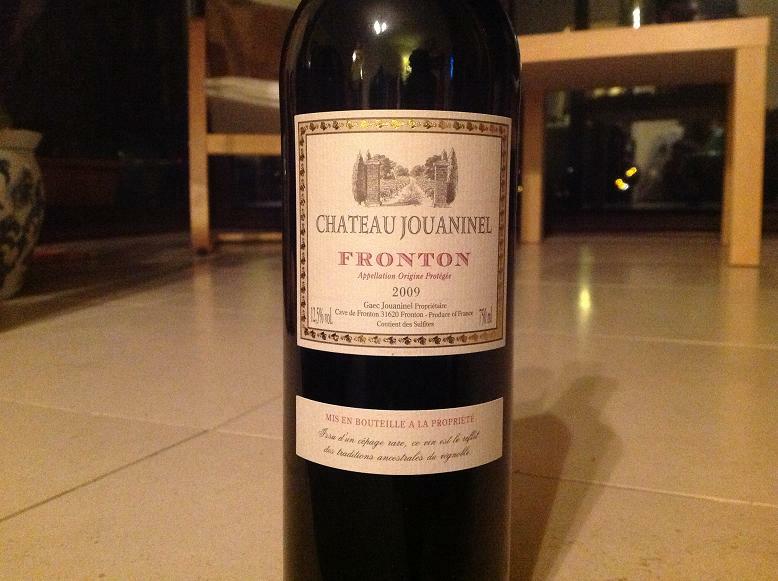 One notable success story was this Fronton from the Deep South of France. Barely registering on the fruitometer, the overwhelming and delicious flavour is of a freshly baked rosemary focaccia served on an earthenware plate and drizzled with olive oil. Herby rather than fruity, and rich and spicy, it went superbly with a pepperoni pizza. £7.99 or £6.99 for two or more bottles. I must also award a WART Medaille d’Or for a recommended drinking temperature clearly displayed on the back label. 17 Celsius is the advice. That’s at least five degrees cooler than your living room. Please chill a little. I’d actually open it at 15° and let it warm. If you are a Majestic fan, look out for more wine notes on this blog over the next few weeks. This entry was posted on Tuesday, November 6th, 2012 at 12:54 pm	and is filed under Rest of France, Serving Wine. You can follow any responses to this entry through the RSS 2.0 feed. You can leave a response, or trackback from your own site.